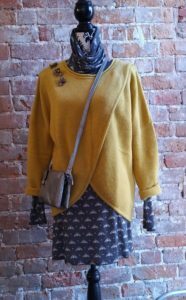 We’re all abuzz At the Wall this week with an adorable Fall look that doesn’t sting! How fun is this long sleeve lightweight knit tunic with a soft turtleneck detail? 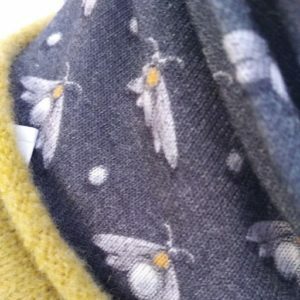 It’s covered with our winged friends injecting at dash of yellow into the grey/white tones, AND, it’s all Canadian, designed and made in Montreal by Kollontai. 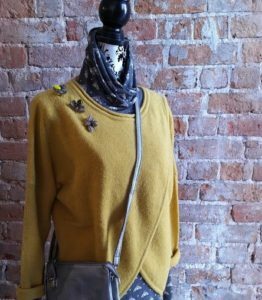 The temperatures will cool sooner than we want so be prepared with a yummy sweater in mustard yellow from Skunkfunk – a blend of 50% wool with nylon and elastane to keep it’s shape. Soft and cozy, the draped tulip hem is just a little flirty. Cross-over bag…say no more. 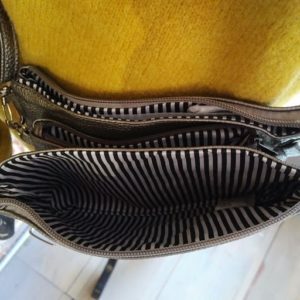 A must have for the season from Montreal sister designers who are Caracol. 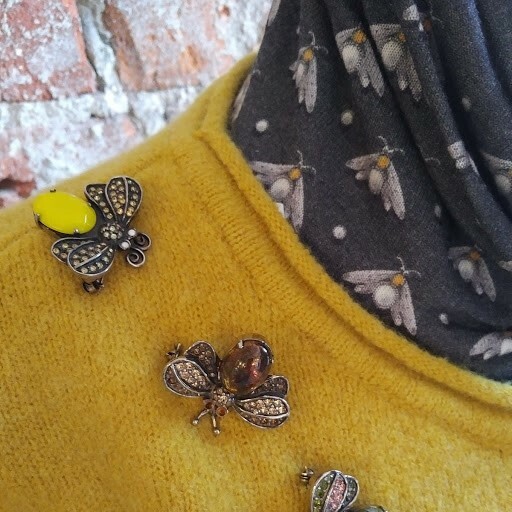 We just love the bee theme and added a little more honey with a collection of pins from Toronto’s own King of glamour Danny Pollak. Lots of space in this cross-over.